Date/Time - 4 Dec (Sunday), 7 p.m. 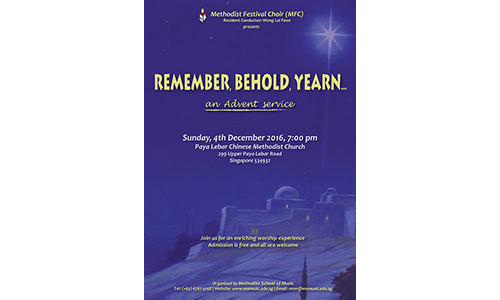 Description - The Methodist Festival Choir will be performing during this season of Advent, which anticipates the coming of our Lord Jesus Christ. Come for an enriching worship experience as we are invited to remember the coming of Jesus Christ, behold God’s glory, and yearn for Jesus’ coming again. Organised by Methodist School of Music. Free admission.